So a few days ago, I revealed the color scheme I'd be using in my attic bedroom later this summer. (Check out the inspiration-laden post here.) Basically, I'm going to mix turquoise, chartreuse, baby blue, and a little mint green with neutrals like cream and gray. It will definitely be a major contrast to my current color-explosion of a room. 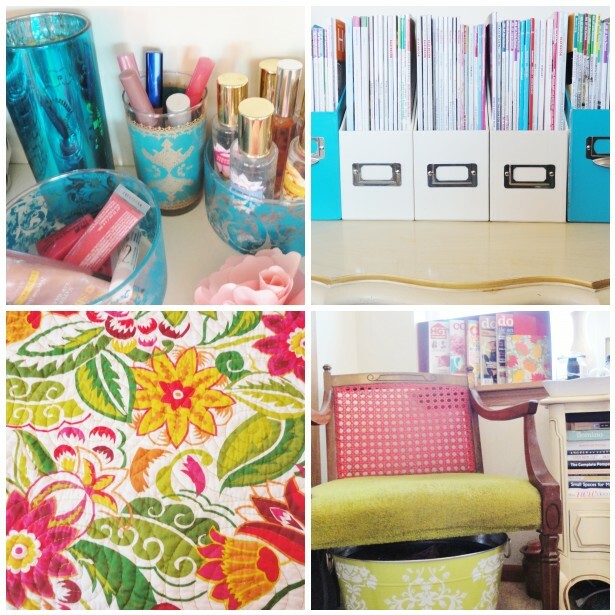 (To see the color explosion I'm talking about, take a tour of my bedroom.) I've had a few emails asking how I decided on a color scheme. Where did I begin? Where did I find inspiration? So let's get down to business. Early on, I decided I wanted to do something totally different. I've been living with the orange+red+green scheme for about a year now. Before that, it was pink+orange+blue+green. While I love those colors and will probably eventually come back to them in one way or another, I also love change. I love mixing things up. So I went back to the drawing board. One of the first colors I thought of was turquoise. Turquoise is my favorite color. When I lived back home with my parents, my bedroom was painted a gorgeous shade of deep teal. Furniture and accessories were cream, black, gold, and bits of orange. It was rich, luxurious, and lovely. And I miss being surrounded by that shade. (You can see in my current space that I've even snuck turquoise in just because I like it.) So I decided that in this next bedroom, I'd bring my favorite color back in. Another major reason behind my color scheme is thinking about what I already own. I'm not on a budget that's going to allow me to go out and buy a whole bunch of new accessories. So I'm probably going to spray paint my desk organizer a shade of teal, blue, or green... as well as the metal magazine rack. The back of my lovely little vintage chair is going to get a nice coat of turquoise paint. And my super colorful quilt? It's reversible. And it's a gorgeous shade of yellow green on the flip-side. Top Left: See, I already have turquoise glassware. Top Right: ...And lovely turquoise magazine holders. Bottom Left: This quilt is solid green when reversed. Bottom Right: I'll paint turquoise over the red on this chair. Also, I got to thinking about what I have packed away in boxes back at my parents' house. 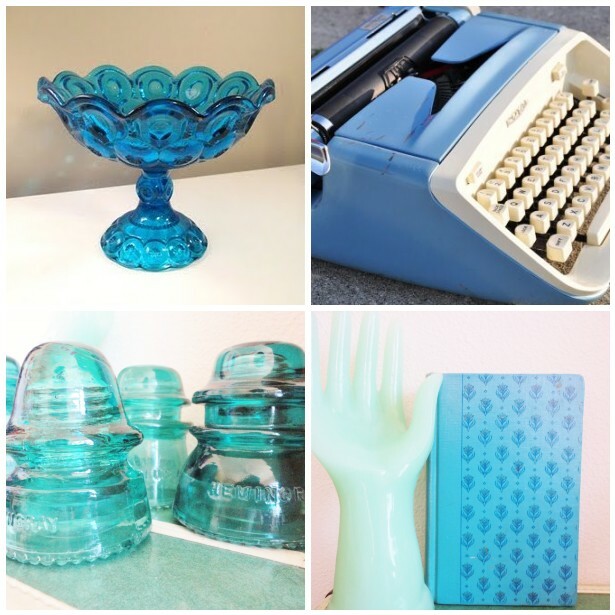 Top Left: I have a small collection of antique turquoise glassware similar to this dish. Top Right: I have a beautiful, vintage, baby blue and cream typewriter from the 1960s. Bottom Left: Not to mention, I scored these teal insulators during a recent antiquing trip. Bottom Right: As well as this mint hand and adorable little blue 1917 book. Have you thought about staining the chair a nice cream or gray to go along with the rest of your color scheme? Love the colors. Can't wait to see the finished product!